The story is set in Port Elizabeth, a provincial city in 1963 at a time in which the government’s violence against resistors of the segregationist legal system was at its apex. Piet, a White Afrikaaner sympathizes with the resistance. His wife Gladys identifies with her British family roots and has recently been hospitalized because of a trauma resulting from the government’s raid of their home and the confiscation of her personal diaries. Piet’s best friend, Steve, is Coloured (biracial) family man who decides to leave the country for England, where he hopes his children will have a better life. The tension of living in political turmoil is heightened by the violation each character feels and their reactions to the political situation and their sense of fear (or denial) of what the future may bring. The three characters’ lives are all on the brink of disaster when it becomes known that Piet is accused of being a political informer. 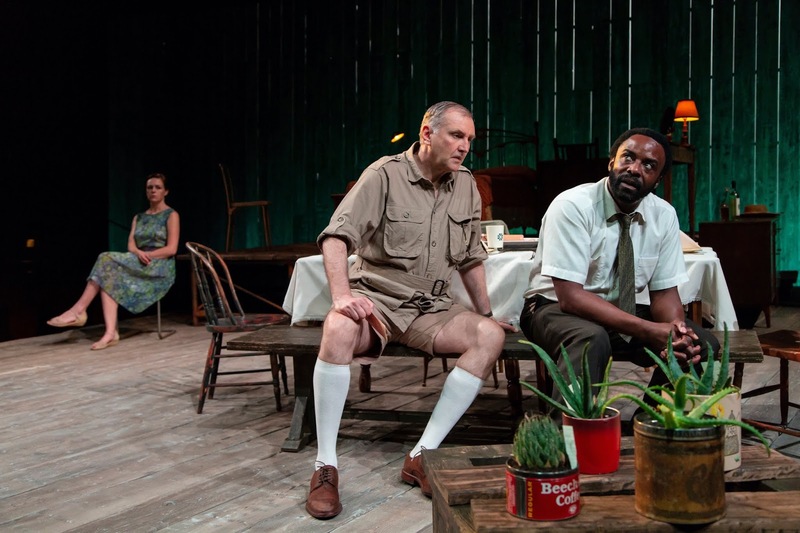 Fugard’s words are potent and director Darko Tresnjak presents us with the similarities of the Apartheid system to today’s world in which political divisions have become entrenched and political ideology destroys civility and civil rights. Matters of immigration, indigenous rights, civil rights, and unfair policies destroy nations, people, families, and friends. In this deeply intellectual and effective production actors Piet (Randall Newsome), Gladys, (Andrus Nichols), and Steve (Ariyon Bakare) are brilliant in exposing the devastation each feels in their environment. Set (Tim Mackabee), sound design (Jane Shaw), and lighting (Matthew Richards) work seamlessly to give the illusion of both open space and claustrophobia. Once again, Hartford Stage’s total concept of the production allows the playwright’s words and the directorial and actors’ interpretations to meld into an effective production that gives the audience much to think about. “A Lesson from Aloes” is not always an easy show to watch, but it is an important play to think about and it deserves praise for the truths it uncovers and presents. A note on the title. The aloe plant is indigenous to South Africa, and though the plant is ugly and full of thorns, it continues to propagate. The rich symbolism is typical of Fugard’s work and his reputation as a social/political observer. The play won a Tony for Best Play in 1981.